Comfort Stairlifts offers top brand stairlifts, keen prices and fast installs for all those seeking heavy duty stairlifts for overweight or clinically obese patients wanting a stairlift. And all work comes with our no-quibble guarantees and famous customer service satisfaction. Give us a call today on 0800 007 6959 to find out about the Castle 1000 XXL new straight stairlift, which is rated for safety up to 31.5 stones or 200kg. The 1000XXL straight stairlift has been designed to meet the needs of a heavier weight transfer from one floor to the next in the home. 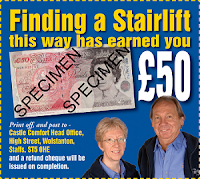 Prior to the 1000XXL being released for sale the heaviest straight stairlift was rated to 25 stones requiring the person to undergo painful weight reduction methods in order to slim down to access a stairlift that would help them to safely navigate the stairs of their home unaided. When you are obese the body quite often suffers multiple side effects and some of these can include the early deterioration of joints due to, for example, the knees and ankles carrying more pressure. This can make it difficult for the overweight person to tackle stairs, which is exactly what the stairlift has been designed to do - makes life easier and safer by letting you still use both floors of your home. According to the NHS if trends continue then half of the UK will be obese by the year 2030! Sedentary activity and other lifestyle factors can combine with genetic bias to produce a life hampered by the knock on effects of obesity. Being able to enjoy your own home is a right and should not require a person to have to move to a bungalow when they have everything they need and like in their own house. With a powered swivel as standard getting on and off the lift will be easier than ever before. Also an extra long seat belt and wider arm rests can accomodate larger framed clients who were at a loss as to how to manage the stairs, even opting to live downstairs in their house as venturing upstairs was so difficult. This 1000XXL heavy duty stairlift can also be sourced on a 1 year interest free finance deal so any barriers to purchase around expense have just evaporated. This means that a lift can be installed for around £25 a week with an affordable deposit. A stairlift for our bigger friends has to be a brilliant addition to an already great range of mobility products. It's true that more and more people are being deemed "obese" and inabiity to exercise through illness can add to the problem. Well done, Castle Comfort Centre, for being realistic enough to cater for everyone's needs. Heavyweight stairlifts? Great. Can you get them over to Argentina for us please? Indeed commentators, thanks for that. Since launching the fact that heavy duty stairlifts are available, we have had an amazing response. Also, we have written to all those folk who have asked about stairlift products for the heavy weight over the past few years and have probably not got fixed up. Keith - MD Castle Comfort Starlifts - we should perhaps re-name ourselves 'CCS Heavy Duty Stairlifts' ? Yes, certainly this lift has become very popular since launching it for those of us who are a little large than average.